Dimensionality the Rivera 3-D-SHAMAN is the aural image of depth of field, much like seeing a 3-D movie, except with your ears. In the new 3-D Shaman Rivera has created a new listening experience. 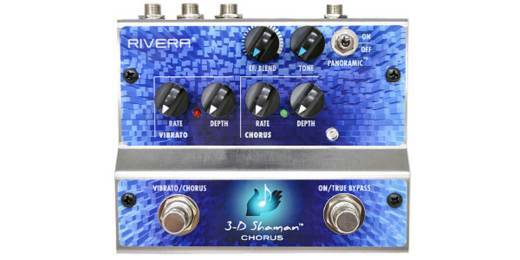 This pedal utilizes a Panoramic control for a breathtaking 3-D Analog Chorus and Vibrato effect. With 3 outputs (wet left, wet right,and dry center), you can run this effect with 1, 2, or 3 amplifiers in Mono (Wet and Dry mixed), Stereo (WetR and Wet L or Wet and Dry), or 3D (Wet R, center Dry, Wet L). Imagine hearing the spread between your amps that makes you and the audience hear a huge aural image, with width and depth you can touch. The 3-D Shaman lets you project large stage presence that major pros get from using multiple amps. Low-noise circuitry, lots of discrete circuits, and a BBD for effects, the 3-D Shaman is truly a studio-quality effect that breaks new ground. Dual independent LFO controls allow for separate adjustment of Chorus and Vibrato Depth and Rate. The Panoramic switch allows you to broaden the aural field to almost Grand Canyon proportions. With Ef.Blend control to add Chorus to taste, and a Tone control to adjust the brilliance, our new 3-D Shaman adds a whole new dimension to your playing.